When submitting a new plan, you will need to meet these seven criteria to ensure your plan is acceptable for registration. The boundaries of the plot must be clearly referenced. A form of orientation must be displayed on the plan (for example north point and grid lines). The plan must contain sufficient surrounding detail (for example fences, adjoining buildings or road junctions) to clearly show the extent and position of the land to be registered. The scale or a scalebar must be displayed on the plan (for example 1:1250 or 1:2500). Any additional references shown on the plan must be clearly identifiable and fully defined (for example rights in common or servitude rights). The scale of the plan must be appropriate in order for the subjects to be plotted onto the basemap for the cadastral map - Ordnance Survey Mastermap© (No smaller than 1:10,000). 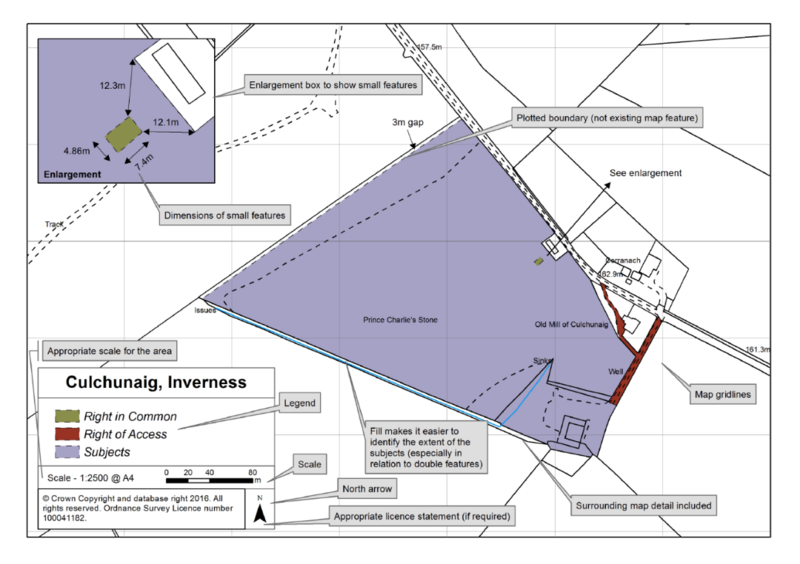 Digitally submitted plans submitted in support of a voluntary registration may use a smaller scale if appropriate. Where the plan is in support of a voluntary registration and does not relate to the text of one specific deed, a legend is required on the plan. The map below shows examples of these criteria.